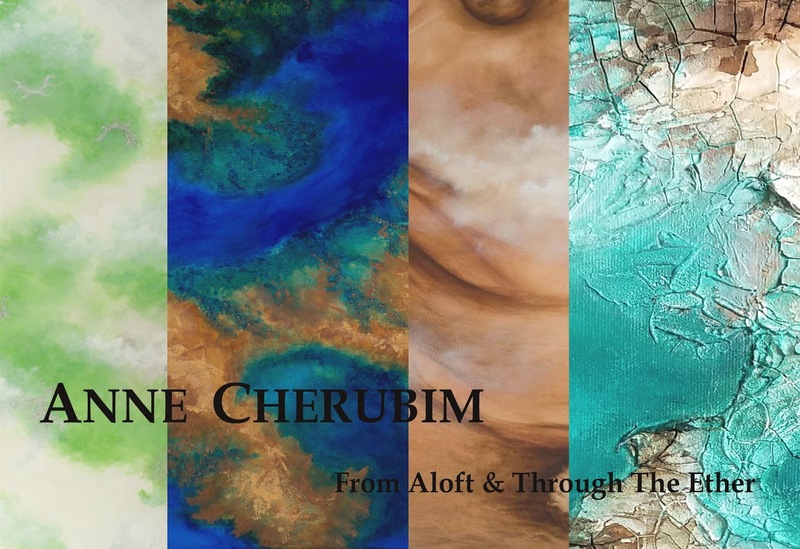 Anne Cherubim's solo show - From Aloft and Through the Ether opened February 7th at the Woman's National Democratic Club, 1526 New Hampshire Avenue NW, DC 20036 The show runs through April 30th, 2019. My current series of paintings is inspired by aerial views, satellite imagery, and the cosmos. Featuring abstract, textural canvases, the paintings depict imagined spaces inspired by real life imagery. Metallic paint causes images to appear to shift depending on how the light hits them, or where the viewer is standing. While I tend to favour a limited palette, the colours of the paintings in the Aerial Inspired series happen to be of a higher contrast within a limited palette in each painting. For this series, I’ve looked at a lot of imagery, (a wondrous task! ), but then but it away, because I am not interested in portraying a copy of the subject at hand. I am more interested in the spirit of what has been seen. Generally, while I am finishing up a series, the influence of the next series of paintings I have in mind tends to creep in to the work, as happened in this case. So some of the later paintings from the Ethereal Series show influences of this attention to aerial imagery. While I embarked on this series, believing that I was exaggerating colours, I came to find these beautiful, vibrant hues exist in the landscape, due to phenomena such as mineral deposits, or algae blooms. While I was aware of such colouring in the plumage of birds, or the colouring of fish, I was not expecting its prevalence in the landscape. Because the environment has been a focus, my natural thoughts have been to ask how aerial views change over time. My assumption is the effects of climate change would be most visible in looking at coastlines. It is my hope to revisit this series in several years, and get my hands on imagery and data that shows the ravages of time. Woman's National Democratic Club, 1526 New Hampshire Avenue NW, DC 20036 10:00am-4pm. It is a good idea to call ahead in case they have a private event going on.